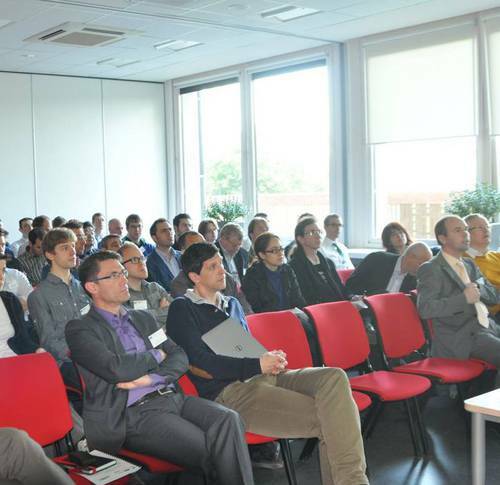 With a focus on Model-Based Systems Engineering (MBSE), the Third Workshop on Mechatronic Design Leuven 2014 was hosted jointly with Flanders Mechatronics Technology Centre (FMTC), a competence center and scientific partner of LCM. Scientists from seven European nations and the USA as well as numerous company representatives from Belgium participated in the workshop. Prof. Chris Paredis was welcomed as keynote speaker. Paredis is one of the most renowned experts in the field of Systems Engineering and heads the Model-Based System Engineering Center at the Georgia Institute of Technology, USA. Recently he became program director at the US National Science Foundation for the programs Engineering & Systems Design and Systems Science. One motivator for intensified cooperation between FMTC and LCM in the “Mechatronic Design and Model-Based Systems Engineering” was the founding of the “International mechatronic alliance” in December 2012, to which the LCM with the Belgian Centre of Competence in Mechatronics, FMTC in Leuven, and FIMECC, a Finnish network of business enterprises and research organizations merged.